From the Acadian Evangeline reenacting Mary, to the Watermelon Angel and the Jazzman playing Wiseman, this nativity is a touching blend of Nova Scotia and Louisiana, a cultural mix of North and South. 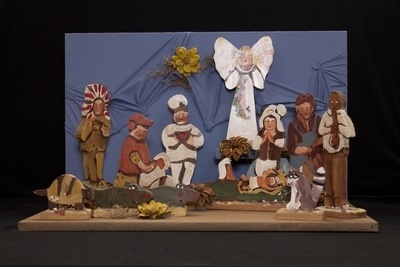 Handcut and handpainted wood figures depicting the nativity of Jesus, created sometime after 1990 in Hahnville, Louisiana by folk artist Lorraine Gendron. Exhibition label originally written by Fr. Johann G. Roten, S.M. for exhibit held at Roesch Library, University of Dayton.